On a 7-day springtime cruise, acquaint yourself with the Dutch culture as you visit art galleries, museums, and the cities of Enkhuizen, Sneek, Rotterdam and Amsterdam. Choose from optional excursions such as cycling or walking tours, visiting history museums or Dutch farms and tulip fields—which will be in full bloom. Tour the renowned Keukenhof flower gardens. Sample traditional Dutch cuisine—including their famous cheese. Enjoy this cruise on its own or pair with the Heritage Highlights tour, April 15-19, 2019. Arrive in Amsterdam from home, or continue your experience from the Heritage Highlights tour. Embark the cruise ship by 5 pm. After getting settled, investigate the ship and meet your fellow passengers. Explore the historic North Sea trading port of Hoorn on foot or by bicycle. This afternoon, cruise to Enkhuizen where you can take a guided tour of Zuiderzee Museum to discover cultural traditions and maritime history or join a tour of local tulip fields and Dutch flower farms. Spend the rest of the afternoon walking or biking through Enkhuizen. Later, relax while watching live entertainment on the ship. This morning, on a guided stroll in Enkhuizen, appreciate the charm and beauty of this historic harbour village. Or for an authentic local experience, go to the home of a Dutch family to sample local specialties and engage in conversation. Enjoy a brief afternoon cruise to the province of Friesland. In Sneek, visit the Royal Eise Eisinga Planetarium—the world’s oldest planetarium still in operation. See if you can spot this region’s world-famous black-and-white cows and black Frisian horses. Embark your ship in Sneek. Relax before dinner. This evening, watch more live entertainment on board. Today, learn about traditional shipbuilding at Lelystad’s Batavia Shipyard and board a replica of the historic ship Batavia. Later, back on board the cruise ship, sample wine and cheese—there is nothing like Dutch cheese! After breakfast, attend an onboard lecture about Holland and taste authentic Dutch Deventer Koek (you’re on vacation, you can eat cake in the morning.) Later, you can take a guided tour of the Airborne Museum of Hartenstein commemorating the 1944 WWII Battle of Arnhem. Or peruse art and artifacts at Arnhem’s Kröller-Müller Museum, which houses the world’s second-largest collection of Van Gogh paintings. Overnight, cruise to Rotterdam. 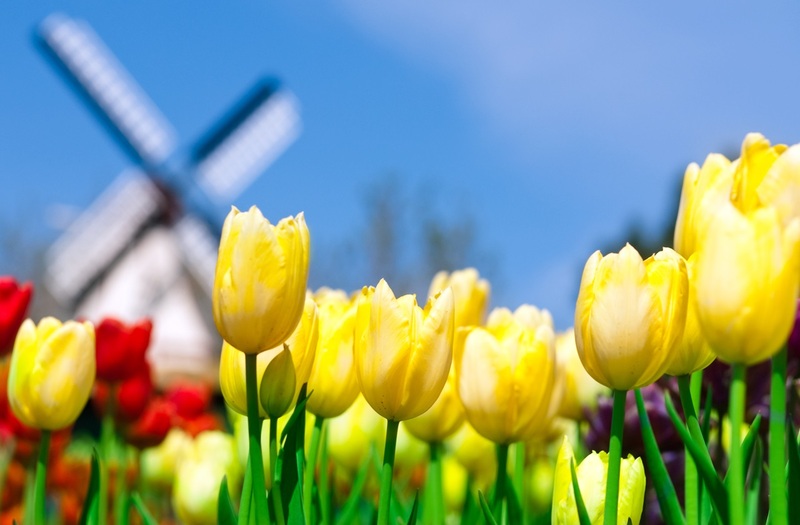 Tour Keukenhof Gardens for a full- or half-day guided experience, or visit Gouda—famous for its Dutch yellow cheese, stroopwafels (syrup waffles), and Gouda candles. Sample artisan beer, a slice of appeltart (Dutch apple pie), or a koffie verkeerd. You could also borrow a bike from your ship to investigate Rotterdam and the surrounding area. As the ship cruises to Amsterdam, unwind from a busy day with more onboard entertainment. Enjoy a guided canal cruise of the iconic waterways of Amsterdam. Float along the grachten, past Amsterdam’s stately homes of the Golden Age. Join an optional culinary excursion through Amsterdam to sample sweet and savory Dutch delights. Or go on a cycling jaunt to see the countryside. If you prefer, see Holland’s beautiful medieval Muiderslot Castle. Later, explore Amsterdam’s colourful streets, canal houses, galleries, and shops. Following a farewell breakfast, disembark the ship and transfer to the airport to fly home with a heart of full amazing memories and experiences.